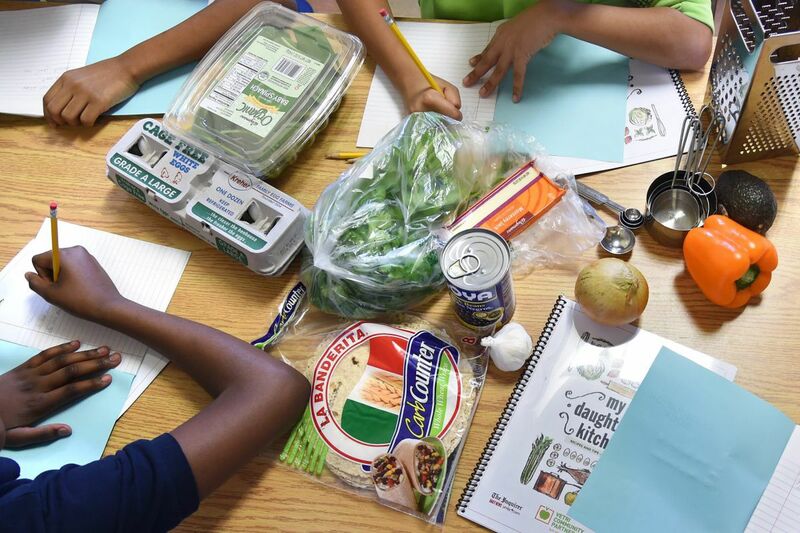 With the breakfast burrito ingredients meal ready to go, students at Cramer Elementary School in Camden begin the first of this semester's weekly cooking classes by filling out their notebooks. Nyzir Jackson, 10, signed up for cooking classes because his grandmother was a chef. Star Marie Cebollero Rodriguez, 10, wanted to learn to cook. Chris Marte, 11, thought it would be fun. But Janiayah English, 10, had a more specific goal in mind: "When I am 11, I want to make breakfast and dinner for my family." Janaiyah had no idea how brilliantly she played in to my goal for this eight-week session of My Daughter's Kitchen cooking classes: to get each child to prepare a meal for his or her family at home. We will be working toward the skills needed to do that over the next several weeks with these students from Alfred Cramer Elementary School in Camden. But to have a student who already aspired to that — that was a gift. Star Marie Cebollero Rodriguez, 11, pours eggs into skillet. Home cooking has been on the decline for decades; research shows it has fallen by half since the mid-'60s, with so many two-working-parent families, packed schedules, and, of course, the increased availability of fast foods and prepared meals. Yet many experts, including food guru Michael Pollan, believe cooking is the single most important thing you can do to improve your health. "People who cook eat a healthier diet without giving it a thought," Pollan says. Indeed, he asserts that the collapse of home cooking led directly to the obesity epidemic. The mission of these after-school cooking classes is to illustrate the simplicity of cooking, to teach nutrition along the way, and hopefully to inspire these children to cook for themselves and their families. Cramer is just one of the 35 urban schools around the region where volunteers are teaching children how to prepare healthy and affordable dinners. As the weeks progress, we will visit other locations. Janaiyah English, 10, stirs the eggs. "Don't try to do things you don't know how to do all by yourself," Chris said. "Clean up after yourself," said Kyajah Alford, 11. And perhaps my favorite, from Nyzir: "Never give up." We were making breakfast burritos, and though no one had had burritos for breakfast before, or with scrambled eggs, they were open to the idea as we reviewed the recipe, and added another rule to our list: "Try new things." It's my experience that children who are cooking become more invested in tasting, it's not something strange anymore, but something that has been transformed from ingredients they have seen, touched, smelled. Their curiosity often outweighs their fear. At Cramer, Nyzir and Kyajah had some experience cooking, but none of the children had much exposure to working with recipes or measurements. At home, their families cook without them. "When you're learning to cook, recipes give you an idea of how to season and how long to cook things," I told them. "But as you learn, you can adjust dishes to your liking." As the children prepped the list of ingredients — chopping the onion, garlic and pepper; measuring the spices; cracking the eggs; grating the cheese; draining the beans — Marjorie Cutler, a special-education teacher at Cramer who was working with us, kept finding ways to point out the connections to school lessons. When Nyzir measured only a quarter of a teaspoon of paprika instead of a half? No problem. We figured out that we just needed to add another quarter teaspoon. "Fractions! That's real-world math Nyzir," Ms. Cutler said. "We're going to share that in class tomorrow for all those who think they don't need math outside of school." The next mistake was harder to fix. Nyzir added half a teaspoon of cayenne pepper, instead of a fourth, to the prep bowl with the paprika, which is the same color. "Well, how do you feel about spicy food?" I asked the kids. Chris Marte and Janaiyah English eat their breakfast burritos. We pushed on. Once the vegetables were sauteed and the eggs scrambled, the kids assembled their own burritos, committing to memory their places on the cooking sheet before it went in the oven. And after the table was set and we sat down to eat, the reviews were good, in fact better than some of the kids expected, but a little spicier, too. "Oooh, that is a little hot," said Star, waving her hand in front of her mouth. Adding more avocado slices cooled it down a bit. "Mmmm," said Kyajah. "I like really it," said Janaiyah. "It's so good," said Chris. Acknowledging that it would be difficult to make these at home before school, I asked the students if they thought they would make them at home, maybe on a Sunday night to have for breakfast all week, or even for dinner. The kids nodded. But Nyzir had a better idea: "I think I could sell them!" he said. "Real-world math, Nyzir," she exclaimed. "Real-world math!" Contact Maureen Fitzgerald at mydaughterskitchen@gmail.com.